Jose Arrieta is leaving GSA to become the deputy assistant secretary for acquisition and senior procurement executive at the Department of Health and Human Services. Sources say Arrieta, who joined GSA about a year ago, will start at HHS in early January 2018. He replaces Angela Billups, who joined the Education Department as its deputy chief acquisition officer and SPE in January 2017. Arrieta’s decision to move to a larger agency with an acquisition budget of $24.7 billion in fiscal 2017, according to USASpending.gov, is only surprising in the fact that he stayed at GSA for just a year. During his tenure at GSA, Arrieta led the effort to test out the cybersecurity concept called blockchain. He told Federal News Radio in November that blockchain would make it easier for vendors on the Schedule 70 IT program to establish contracts through automation. The fact that Arrieta experimented with an emerging technology and proved it out sends an important signal not only for other acquisition professionals, but also that GSA is willing to let its people take smart risks. Few other agencies, the Homeland Security Department is one exception, would allow an employee to experiment with a key program like Schedule 70. 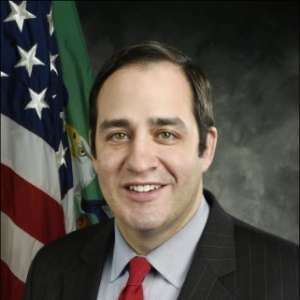 Before coming to GSA, Arrieta worked at the Treasury Department as its director of the Office of Small Disadvantage Business Utilization (OSDBU) and as the Homeland Security Department’s industry liaison and ombudsman. This was Arrieta’s second stint at GSA. He also worked there from 2004 to 2010 as a procurement analyst and contracting officer. It’s unclear who will replace Arrieta. Kirit Amin, the CIO of the International Trade Commission, decided to retire after 11 years in government. Amin has been the ITC’s CIO for three years, coming from the Commerce Department. Amin said his last day will be Jan. 6, and he didn’t know who will take over for him on interim basis. Before coming to ITC, Amin was the deputy CIO and chief technology officer for Commerce. He also worked as the CTO and chief innovation officer at the Department of Housing and Urban Development. He began his federal career as the CIO for the State Department’s Bureau of Consular Affairs. During his time at ITC, Amin pushed hard to modernize the agency’s technology infrastructure. He also worked to reinvigorate the small agency CIO Council, saying small agencies need more help modernizing systems and meeting cybersecurity requirements. Amin helped draft ACT-IAC’s white paper on small agency IT modernization. Amin will be my guest on my Ask the CIO program this week so tune in for our conversation addressing small agency challenges and his career. Mark Glorioso, the director of the NASA Shared Service Center, is retiring on Dec. 31 after more than 20 years in government. The Shared Services Leadership Coalition announced Glorioso’s decision to retire and begin a consulting business. Glorioso ran NASA’s shared services center since March 2014 at Stennis Space Center in Mississippi. The center provides multi-function shared services, including financial management, IT, human resources, procurement services and business support services. The shared service center has an operating budget of $67 million and approximately $433 million in additional agency-provided funding for training and initiatives of benefit across the agency. In some ways, NASA is a model for other agencies looking to consolidate and reduce the costs of back office IT. A 2014 report from the Partnership for Public Service and Deloitte found by locating its administrative support workforce in a single building, NASA personnel were able to more easily interact with each other, contractors and government team members. Team members could also participate in one another’s reviews, which made for stronger teams and greater management accountability. NASA, however, never got into the governmentwide provider business, which may be why those who question shared services point to them as a model versus some of the others who continue to struggle to provide financial management services. It didn’t take long for John Owens to find a new home. The long-time U.S. Patent and Trademark Office chief information officer, who retired on Nov. 2 after more than a decade, joined CGI Federal as a vice president in the emerging technologies practice. CGI announced the hiring of Owens on Dec. 6. CGI says Owens will lead the practice’s solution development group, where he will oversee the continued development of technologies for agencies. During his tenure at USPTO, Owens helped transform the systems that run trademark and patent processing by implementing agile and dev/ops methodologies. For example, Owens told me USPTO could now turn around software bug fixes in 24-to-48 hours, and is using two-to-three week sprints to develop new IT services for patent and trademark examiners with a goal of releasing new capabilities at least quarterly. Owens is no stranger to the private sector. He spent 12 years at AOL before coming to USPTO, serving a technical director of the group who helped develop the Netscape Internet-service provider.